Not to be confused with OMG-my-mouth-is-on-fire-this-is-so-frickin'-hot-I'm-going-to-need-a-fire-extinguisher spicy. The ancho chili pepper called for in this Spicy Brownie is the kind of spicy that warms the mouth and gives the brownie a full-bodied, sort of smoky flavor without burning a hole in your tastebuds. 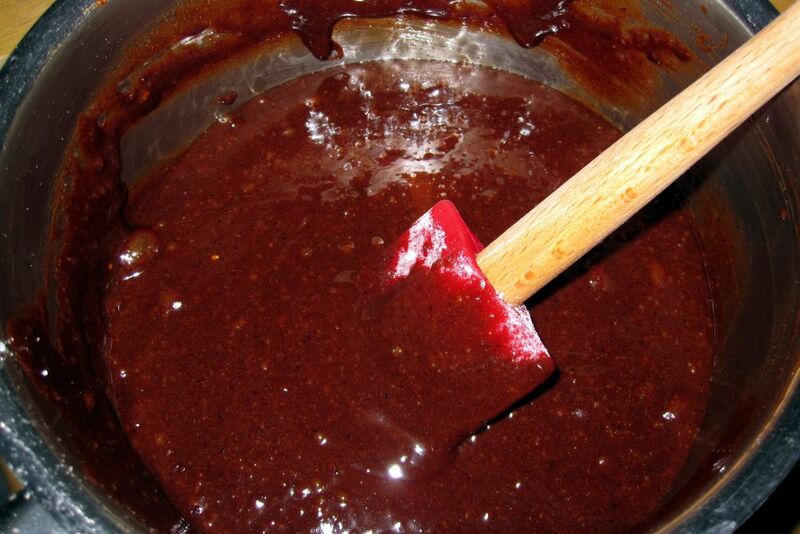 It reminds me of Oaxacan mole sauce, which, as you may know from trying mole, is often not hot at all. So don't panic because of the recipe name; just rejoice. It's an amazingly fudgy brownie (as opposed to cakey), which is my textural preference in brownies. And because it's so dense, not to mention rich from the dark chocolate, you don't need more than a small square piece to do the job. That's why an 8"x8" pan is really plenty to serve a large dinner party. I'm so impressed by this recipe, which I found posted on Oprah.com, and which originally comes from a small, creative bakery in Brooklyn called Baked run by two guys, Renato Poliafito and Matt Lewis, that I am dying to buy their cookbook and try everything in it! I think it's next on my Gift to Self List. Preheat oven to 350°. Butter sides and bottom of a glass or light-colored metal 8" x 8" pan. 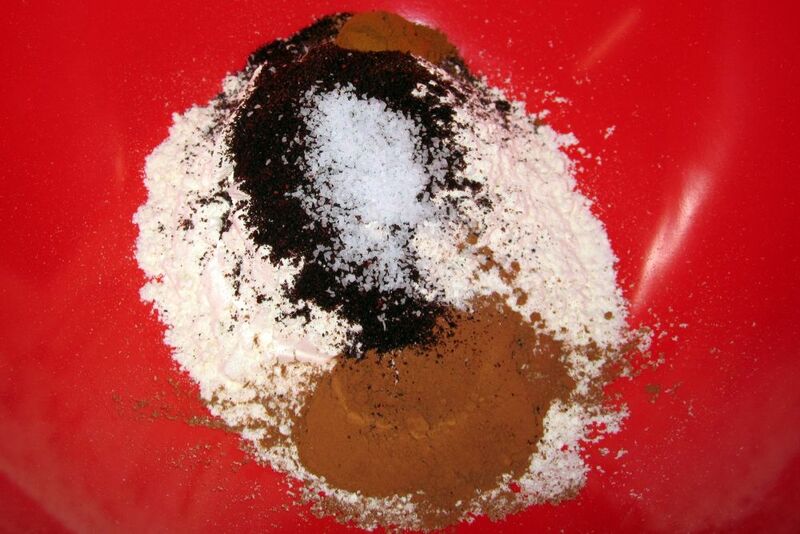 In a medium bowl, whisk together flour, salt, cocoa powder, chili powder, and cinnamon. Configure a double boiler (fill a medium saucepan with 2 inches of water and fit a metal bowl on top without letting it touch water; bring water to a boil). Place chocolate and butter in bowl and stir occasionally until both are completely melted and combined, about 6 minutes. 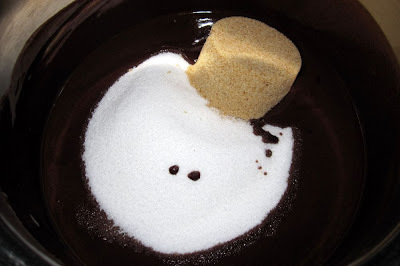 Turn off heat, but keep bowl over water and add both sugars. Whisk until completely combined and remove bowl from pan. Let stand until room temperature, about 20 minutes. 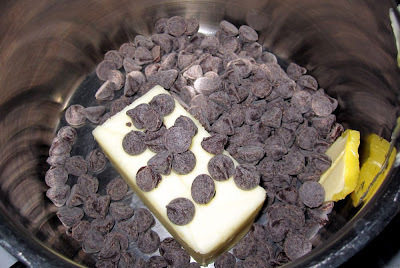 Add eggs to chocolate-butter mixture and whisk until just combined. Add vanilla and ginger; whisk to combine. Do not overbeat the batter at this stage or the brownies will be cakey. 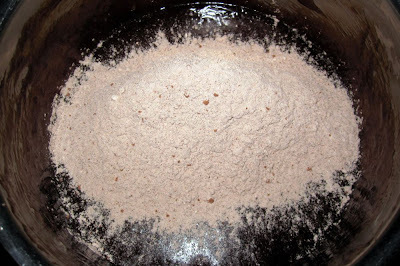 Sprinkle flour-cocoa mixture over chocolate mixture. Using a spatula (do not use a whisk! ), fold the dry ingredients into the wet until there is just a trace amount of the flour-cocoa mix visible. Pour batter into the greased pan and smooth the top with the spatula. 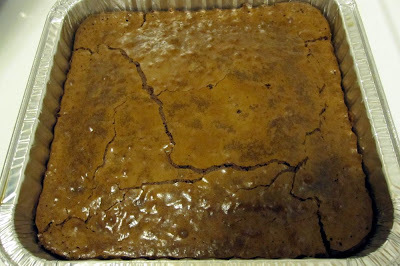 Bake brownies for 27 to 30 minutes; brownies are done when a toothpick inserted in the center comes out with a few moist crumbs. 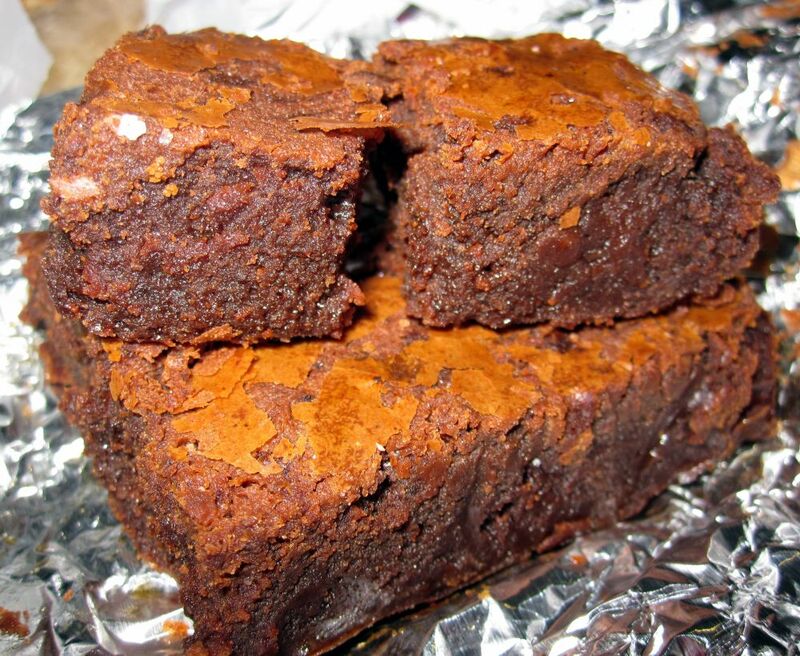 Cool brownies completely before cutting and serving. I love your picture and text. I don't know which description is more mouthwatering... 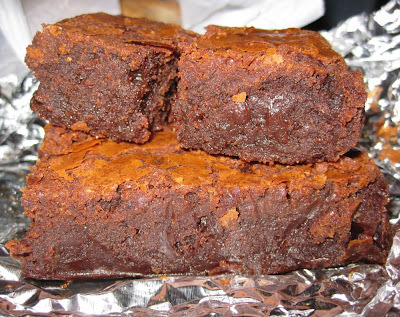 However, having tasted this brownie, I love the fudginess and smoky flavor and so your description perfectly matches the real thing! I agree, cakey brownies are worthless. If it's not fudgy you are doing it wrong. I also hate when people put icing on top, If I wanted icing I would have a piece of cake. Mom - Glad you agree! I sent you home with a baggie of ancho chili powder so you should make this sometime soon! Whoa! I want these brownies! 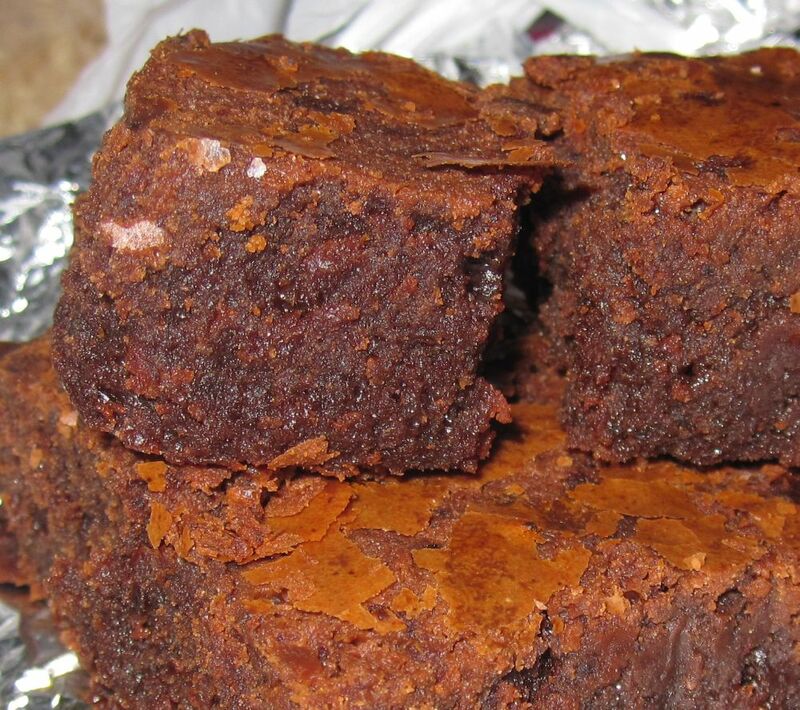 They are what brownie dreams are made of. Haven't baked in forever and just made these. Hope they're close to as amazing as when you made them!